The title of this article is a concise and precise definition of the ecliptic, but further explanation is warranted. Before delving in, I recommend reviewing the definition of a conceptual celestial sphere and reading Understanding a Star Chart to prepare for the material presented in this article. 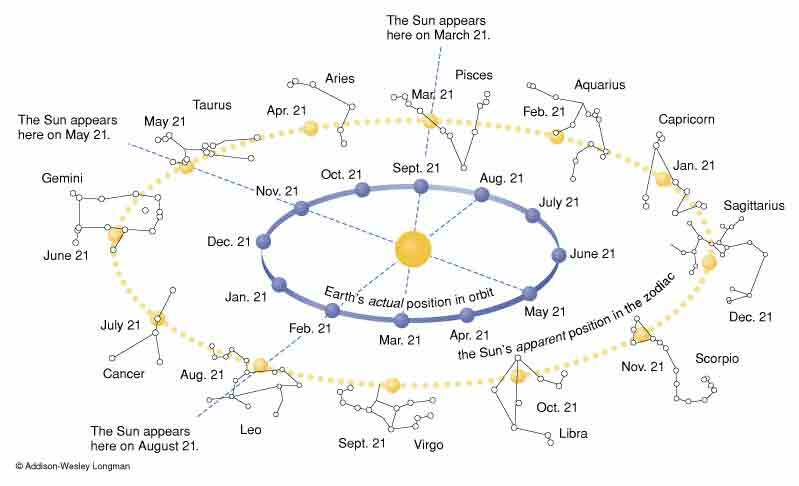 Although the ecliptic is an important aspect of lunar and planetary observations, and seasons on the Earth, this article will concentrate on the Sun’s movement among the stars, and how that movement defines the ecliptic. As the Earth proceeds through its annual journey in its orbit about the Sun, the Sun’s position among the background stars, as seen from Earth changes a little each day. Since we intuitively know that the Sun outshines all of the stars in the sky, so this seemingly makes no sense. But imagine the Sun as a disk no brighter than the Moon. We could then see the Sun and the “fixed” stars on the celestial sphere at the same time, and we could track the Sun’s movements among the stars on a day to day basis. In a year’s time after beginning this exercise, the Sun will have returned to the point at which it started and we will have traced out the full course of the ecliptic across the celestial sphere. The twelve constellations through which the Sun traverses during this annual journey are known as the zodiacal constellations. The Solar Cycle. Addison-Wesley Longman. lasp.colorado.edu. Accessed by Jim Johnson on February 13, 2015. The Sun in the preceding image is in a fixed position for the purpose of this discussion. The Earth orbits the Sun as indicated by the blue circle with dates indicating progress through one orbit over the course of a year. Consider the Earth’s position on the blue circle on March 21st. When viewed from the Earth on this date, the Sun appears in the constellation of Pisces. Now consider the Earth’s position six months later on September 21st, and trace a line from the Earth through the Sun to see that it would appear in the constellation of Virgo. The specific line that the Sun seems to trace among the fixed stars on the celestial sphere as a result of Earth’s orbit about the Sun is called the ecliptic, and is indicated by the horizontally oriented sine wave on the flat projection map of the entire celestial sphere below. This is a great place to start an exploration of the ecliptic. 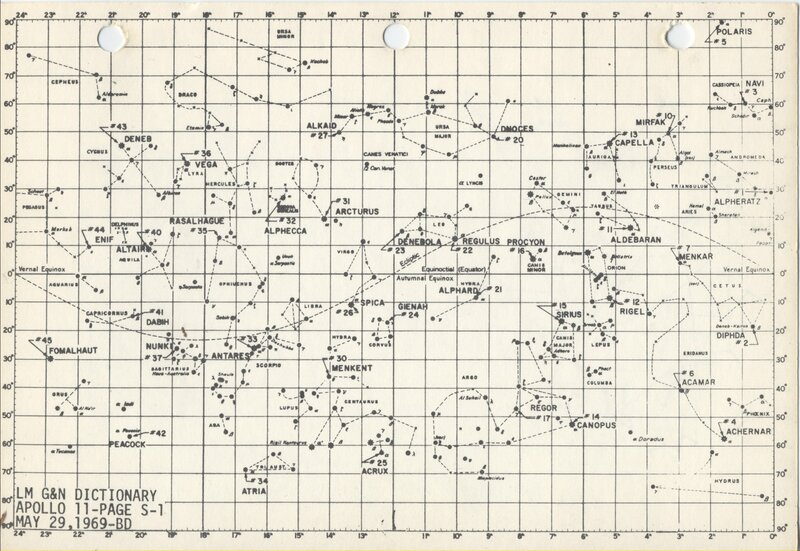 This particular map is a scan of the actual constellation map carried aboard the Apollo 11 lunar expedition. First, let’s become familiar with this map. Flown Version of LM G&N Dictionary, Apollo 11, Page S-1, May 29, 1969-BD. Private collection scans courtesy of Larry McGlynn. https://www.hq.nasa.gov/alsj/a11/ A11StarCharts.html. Accessed by Jim Johnson on July 18, 2014. The horizontal lines are representations of degrees of declination, with 0° declination, or the equator across the center of the page, and the north (+90° declination) and south poles (-90° declination) are at the top and bottom edges of the page, respectively. Note that the vertical lines representing hours of right ascension do not converge at the poles (top and bottom edges of the map), because this is a flat projection. 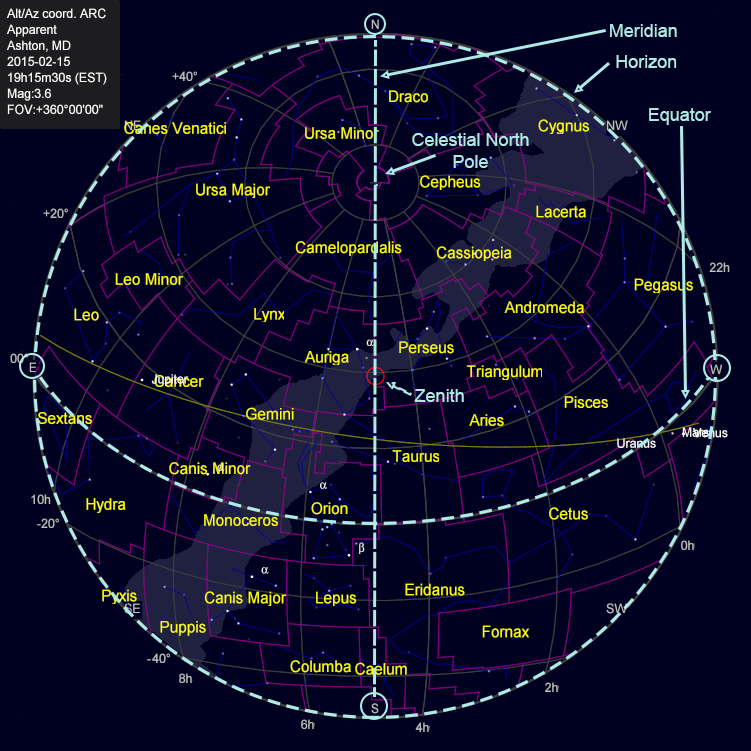 To more closely relate the flat projection map to the celestial sphere, note that the zero hour of right ascension on the right edge of the map and the 24th hour on the left edge of the map are one and the same, so the right and left edges of the map can be brought together with the observer in the imaginary center of the map tube that is formed. The implication of this is that if one’s point of gaze slips off of the left edge of the map at, say +40° declination, the point of gaze would immediately appear on the right edge at +40° declination. Compare this map to the sky map that follows below, and that was discussed in Understanding a Star Chart. The sky maps are contained within a circle that represents the horizon, and the stars contained therein are the stars that can be seen above the horizon at a specific point in time. The Apollo 11 flat projection, however, represents the entire celestial sphere. The ecliptic on the sky map below is designated by the yellow horizontal line that stretches from east to west, just north of the equator. Let’s trace the ecliptic on the sky map below and compare the various aspects discussed with the Apollo 11 constellation chart above. Begin at the western horizon, where at that point the ecliptic lies south of the equator. Moving eastward (toward the left) along the ecliptic, notice that it crosses the equator (0°) at 0 hours (0h) of right ascension in the constellation of Pisces. At 6 hours of right ascension (6h), the ecliptic reaches its farthest distance north of the equator in Gemini, at which point it begin converging on the equator again just below the eastern horizon at 12h. Note that the ecliptic transverses several zodiacal constellations on this map. From west to east, they are: Pisces, Aries, Taurus, Gemini, Cancer, and Leo. Annotated Sky Map, Jim Johnson, December 27, 2015. 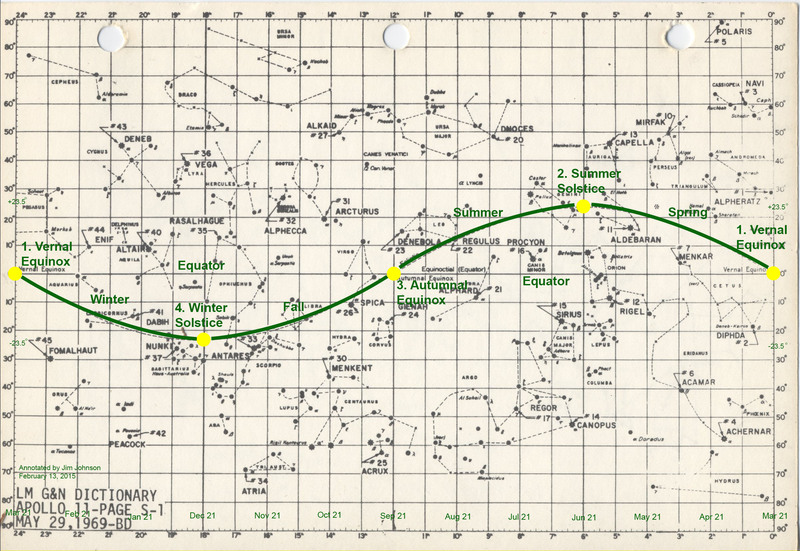 Now we are ready for a more thorough exploration of the ecliptic, which presents as a sine wave on the annotated Apollo 11 map below. The Sun’s journey from one end of the ecliptic to the other, or from the right edge of the map to the left edge of the map, is exactly one year, then the cycle repeats. There are four very important points through which the Sun passes in its annual journey across the ecliptic. The two points at which the ecliptic intersects the equator (0h and 12h) are called equinox, and the points at which the ecliptic reach its farthest declination from the equator (6h and 18h) are called solstice. Let’s step through the Sun’s journey across the ecliptic as presented by starting at the left edge of the map. 1. The Sun’s arrival at the 0-hour of right ascension, or the intersection of the ecliptic and the celestial equator (0° declination), occurs around March 21st. This is known as the Vernal Equinox, or the beginning of astronomical spring. On the date of the equinox, the length of the day and the length of the night are about equal. Astronomical spring extends three months from this date while the Sun travels toward the intersection of the 6th hour of right ascension and +23° declination. 2. The Sun’s arrival at the 6th hour of right ascension coincides with it’s northern most declination of +23°. This point is known as the Summer Solstice, and it occurs around June 21st, marking the first day of astronomical summer. Astronomical summer extends for three months past this date as the Sun descends southward back toward the intersection of the ecliptic and the celestial equator at the 12th hour of right ascension. 3. The Autumnal Equinox is marked by the Sun’s arrival at the 12th hour of right ascension as it makes its south bound crossing of the celestial equator. This occurs on about September 21st each year, and is known as the first day of astronomical fall, which endures for three more months until the Sun reaches its southern most point on the ecliptic. For the second time in a year, the days and nights are of about equal length while the Sun is on or near the celestial equator. 4. The Winter Solstice is marked by the Sun’s arrival at the 18th hour of right ascension, and its most southward point on the ecliptic at -23° declination, on about December 21st each year. This is known as the astronomical beginning of Winter, which endures for the next three months as the Sun ascends northward toward the celestial equator. As noted while describing the Sun’s travels from one edge of the map to the other, it also changes travels northward and then southward in declination from the equator reaching an maximum of +23° declination and -23° declination. This ±23° change of declination is related to the tilt of the Earth’s axis relative to the ecliptic, or the plane of the solar system, and this north and south movement of the sun is related to our four seasons on Earth. This topic will be addressed more thoroughly in The Ecliptic and the Four Seasons. The planets “wanderings” among the fixed stars is also related to the ecliptic, and this topic will be addressed more thoroughly in The Ecliptic and the Motions of the Planets. Look for these two articles in the coming months.